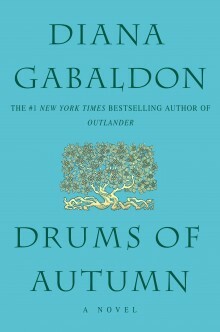 DRUMS OF AUTUMN opens with a hanging. One of Jamie’s old companions from his days in Ardsmuir prison is being hanged for theft, and Jamie has come to lend what support he can. Suddenly the proceedings are disrupted, as another prisoner makes a break for it–and Jamie, moved by the death of his friend, impulsively helps the man, a pirate named Stephen Bonnet, to escape; a decision that will have long-reaching and unforeseen effects. 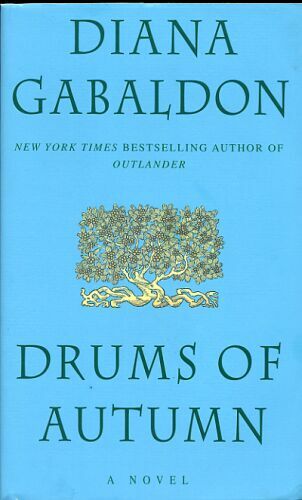 DRUMS OF AUTUMN is the fourth book in the OUTLANDER series, following VOYAGER. Here Claire and Jamie, with Jamie’s nephew Young Ian, seek to find a place for themselves in the colony of North Carolina, treading a dangerous line between Governor Tryon’s patronage and Claire’s knowledge of the brewing revolution in America, between the help of Jamie’s Aunt Jocasta, last of his MacKenzie kin (“MacKenzies are charming as larks in the field–but sly as foxes with it.”) and the unwanted obligations of her slave-run plantation. As they find mountain land and begin to build their first cabin, their newfound life is bittersweet, with the thought Brianna–the daughter Claire has left behind, the daughter Jamie will never see–always near. Brianna is thinking of her parents, too. And she’s discovered something dangerous in the historical record; a notice of a fatal fire on Fraser’s Ridge. The time-traveler’s ultimate dilemma raises its head once again: can the past be changed? If it can…what’s the price? Roger follows Brianna into the past, where she has gone on a quest to save her parents’ lives, and upon discovering that she has sailed for America, he takes ship himself…with a Captain Bonnet. How does time-travel work? Who can pass the stones, and how? What are the risks? And what would make those risks worth taking? Only love.